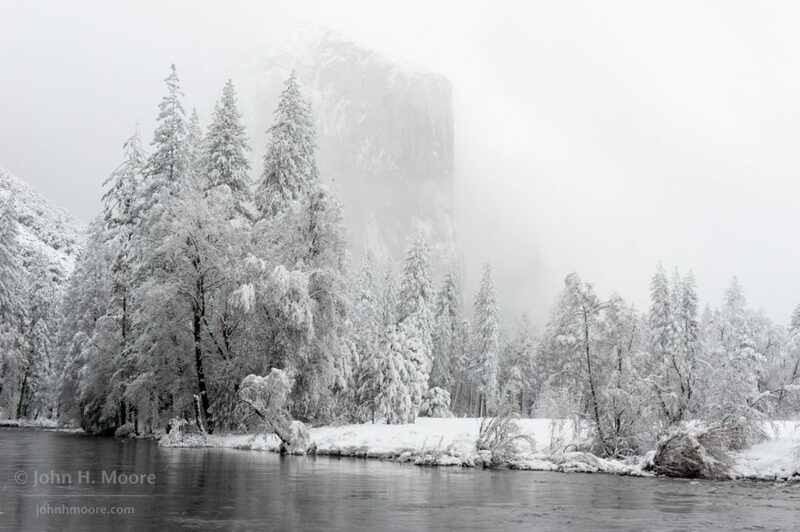 El Capitan peeks out through falling snow. Yosemite National Park. 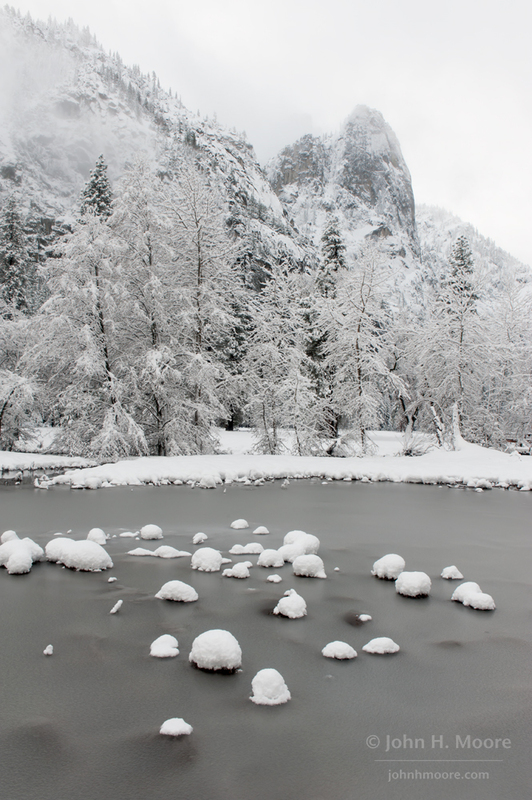 I love Yosemite National Park in winter. There’s room to breathe… and park, and camp, and turn around without hitting a hundred tourists! 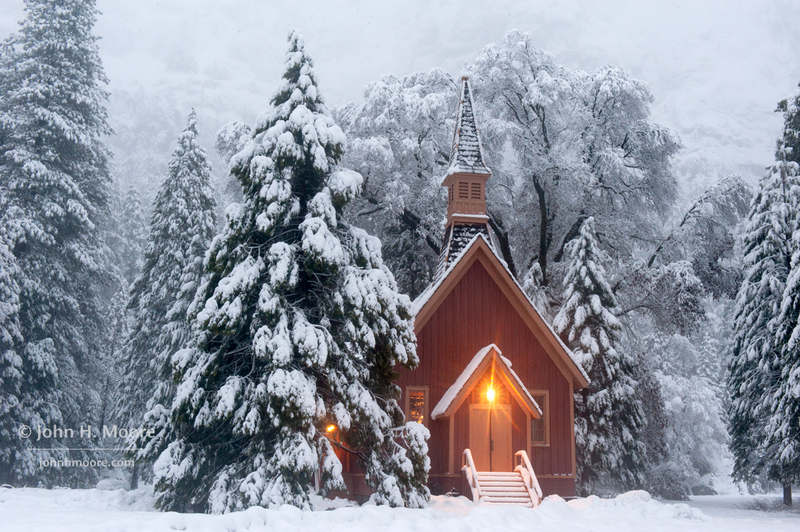 And it is so, so indescribably beautiful during snowstorms. 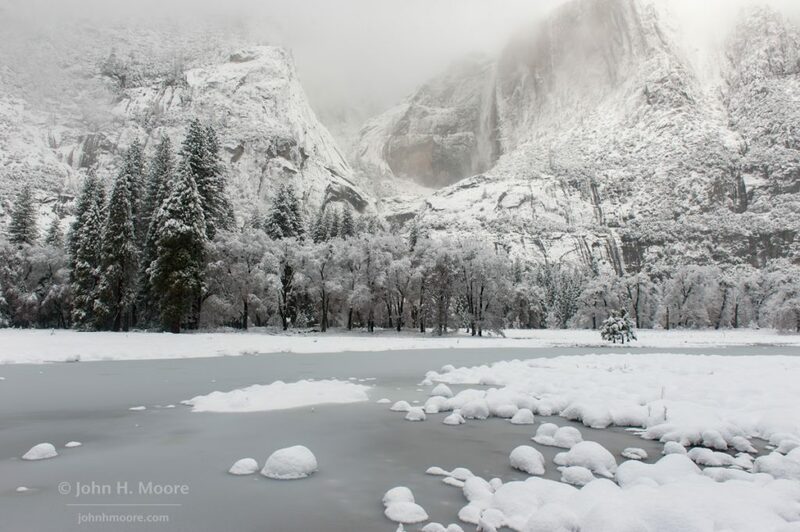 Almost all of my trips to Yosemite over the years have been in winter. 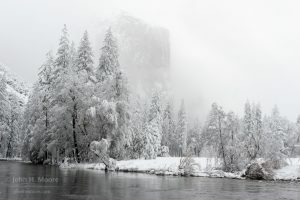 Fortunately the girls (not the eldest girl, who hates nature at this point, but the two younger girls) have also come to love Yosemite during snowstorms. Thanksgiving 2015 there was a big snowstorm forecast for the Valley, so we threw everyone in the car and headed up. Didn’t make it before the storm, thus the whole drive in on 41 was a slow but beautiful, tire-chain thumping, hours-long slog through nighttime blizzard. Had an absolutely fabulous time playing in the snow and the girls have been begging since to do it again. 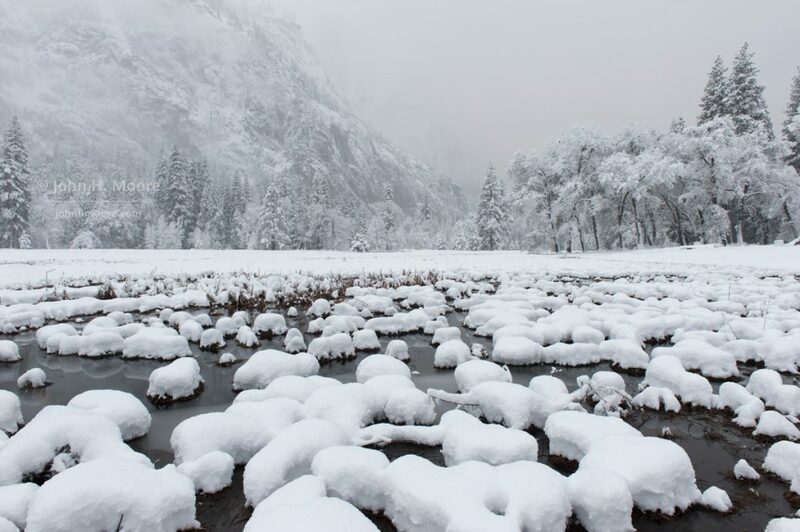 Fast forward to January 2017, which was a very, very wet month for Yosemite–between giant snowfalls (some of which made it down to the Valley floor) and torrential rains that flooded the Valley and caused the park to be evacuated. 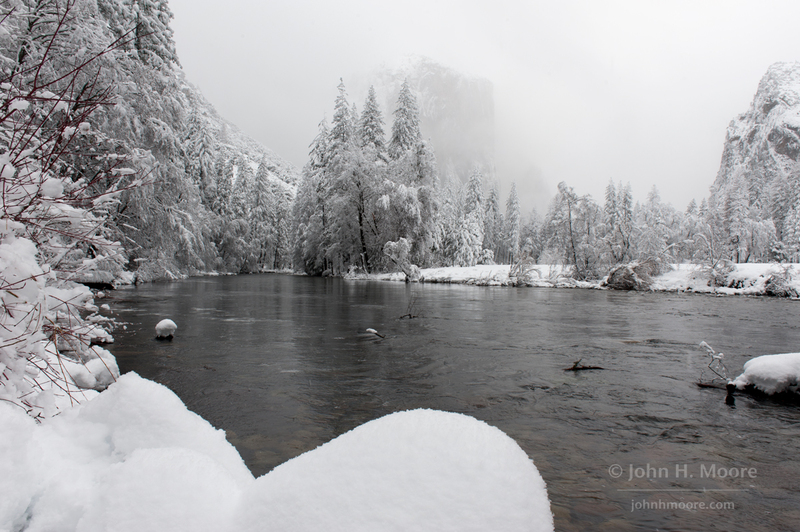 By January 17th, there were several big snowfalls forecast to make it down to the Valley floor (many Sierra snowfalls will dump feet of snow at higher elevations but just rain the the Valley–which sits at just 4,000 feet and is somewhat thermally insulated by cloud cover topping the granite walls of the valley), so we made reservations for a 4-day weekend at the Lodge and started checking our snow gear. We were not disappointed! 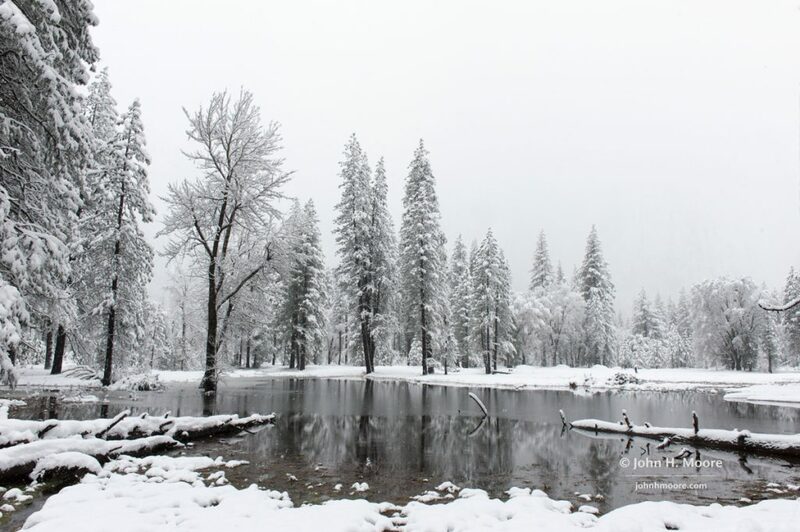 The weekend teetered between rain and snow. 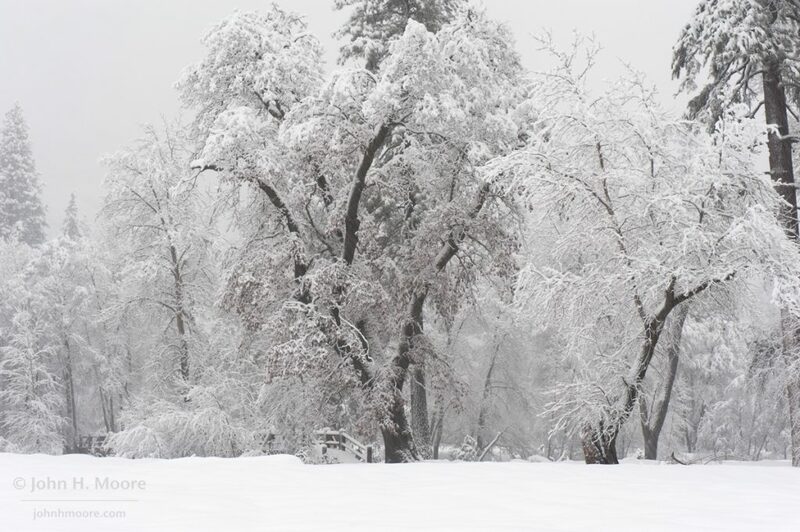 Both Saturday and Monday mornings we awoke to 8-12 inches of new snow covering everything. Sunday it rained all day–but without really melting much of the previous snowfall. 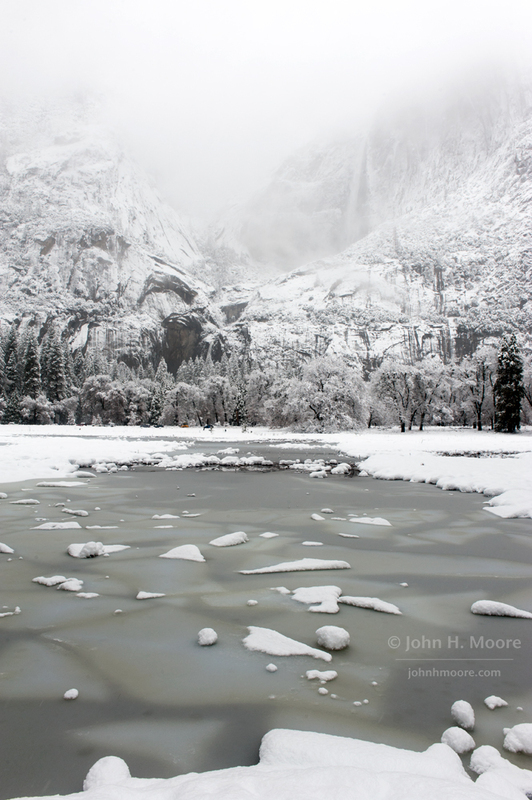 Monday was one of those absolutely classic Yosemite days with a clearing winter storm. I would have killed to stay through Monday and catch more of the clearing skies (as local Michael Frye did), but I had a 2 PM flight out of Fresno to catch for work. 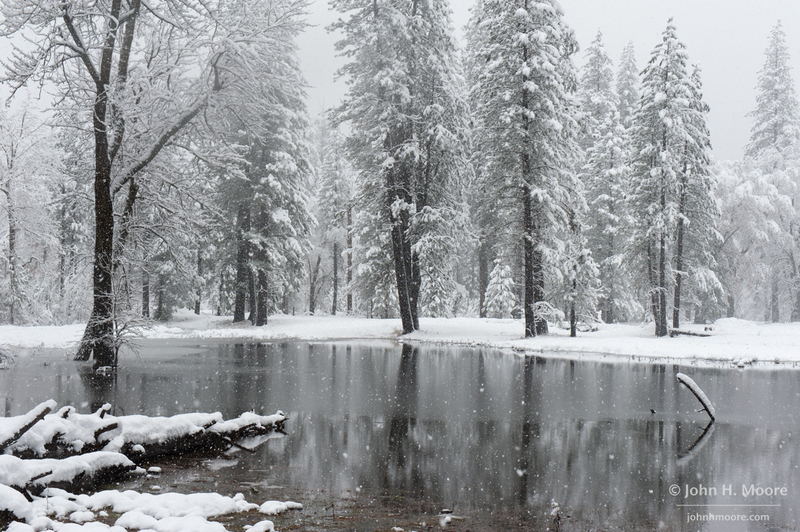 As it was, I stopped so many times on the drive out of the park to take photos… and it took me forever to get the snow chains on that morning… that we pulled up in front of the Fresno Airport just 20 minutes before my flight was to depart. Miraculously, I made it! Below are some of my early culls from an amazing number of “keepers” from that weekend. Flooded field and trees during a heavy snowstorm. Yosemite National Park. 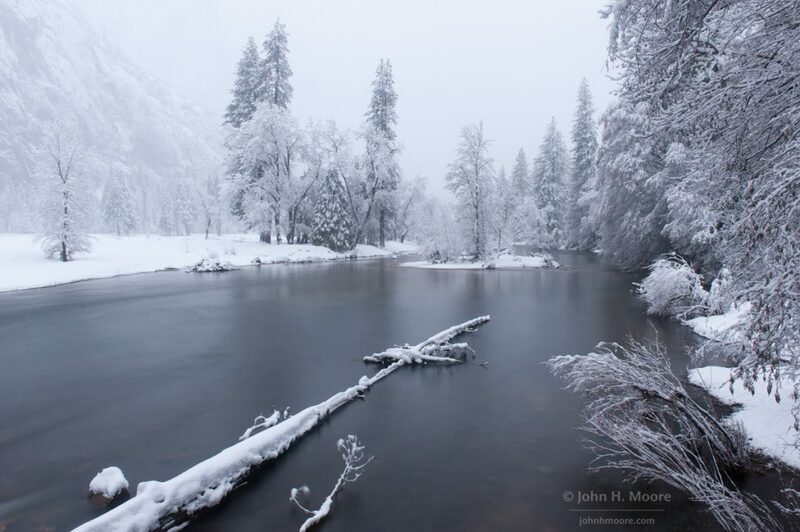 The Merced River in Yosemite National Park during a heavy winter snowstorm. 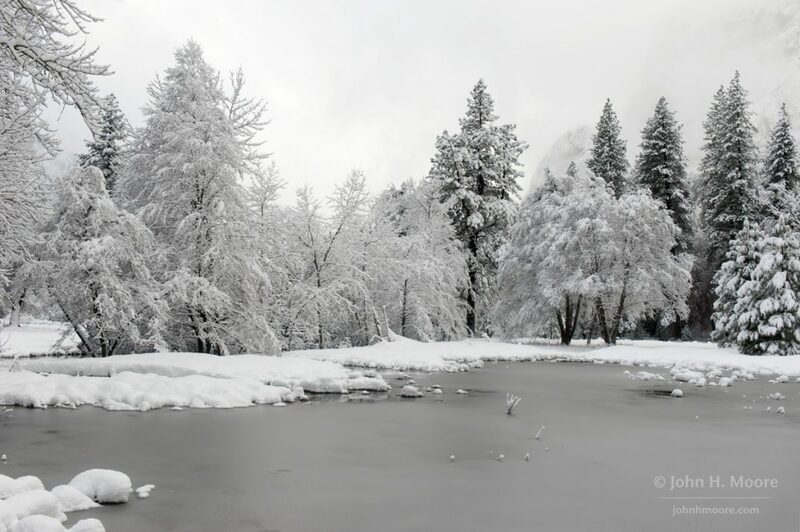 Upper Yosemite Falls looms in the snowfall above broken ice in flooded Cook’s Meadow. Yosemite National Park. Pre-sunrise Merced River in Yosemite National Park during a winter morning snowstorm. A lovely photography mistake! 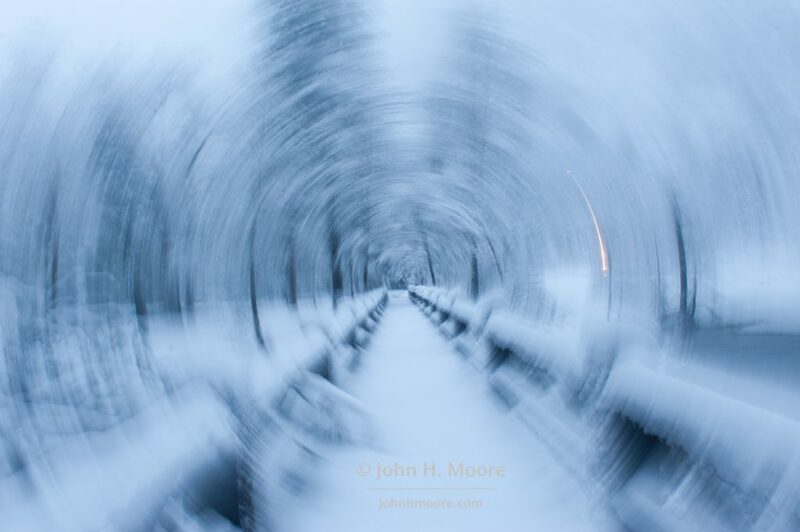 Pre-sunrise on the bridge across the Merced near Yosemite Valley Chapel. 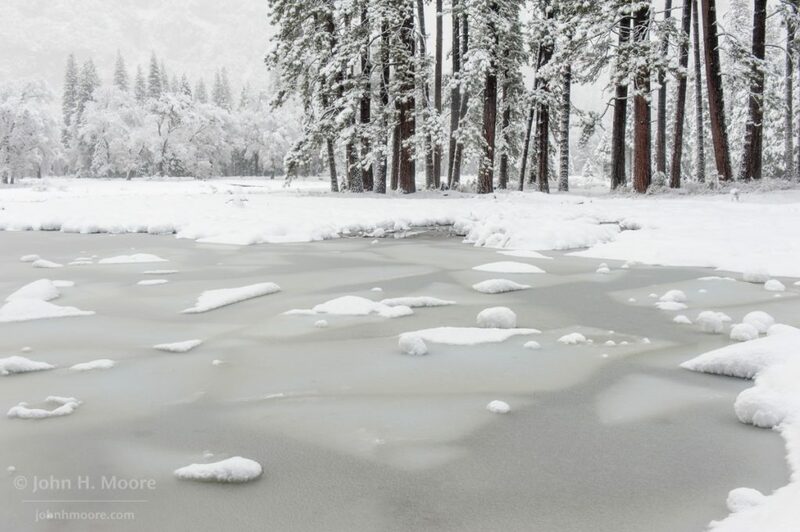 Slabs of ice in a frozen flooded section of Cook’s Meadow, Yosemite National Park. 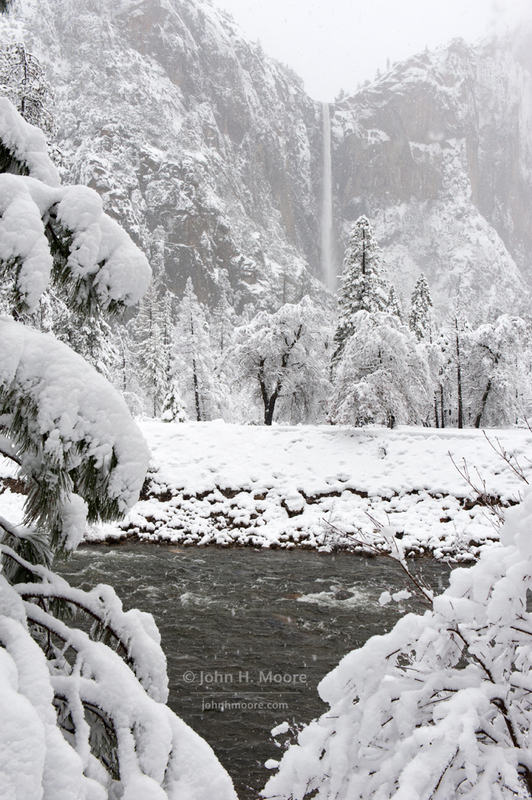 Bridalveil Falls during a heavy winter snowstorm. Yosemite National Park. 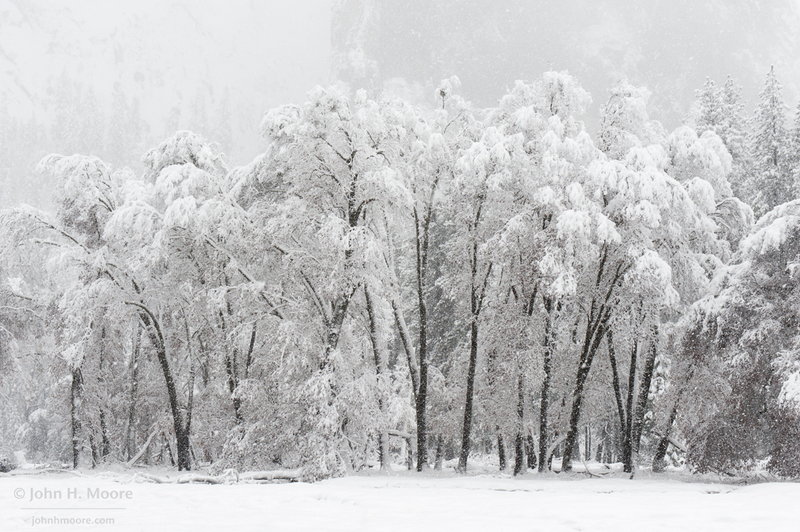 A stand of trees during a heavy winter snowstorm in Yosemite National Park. 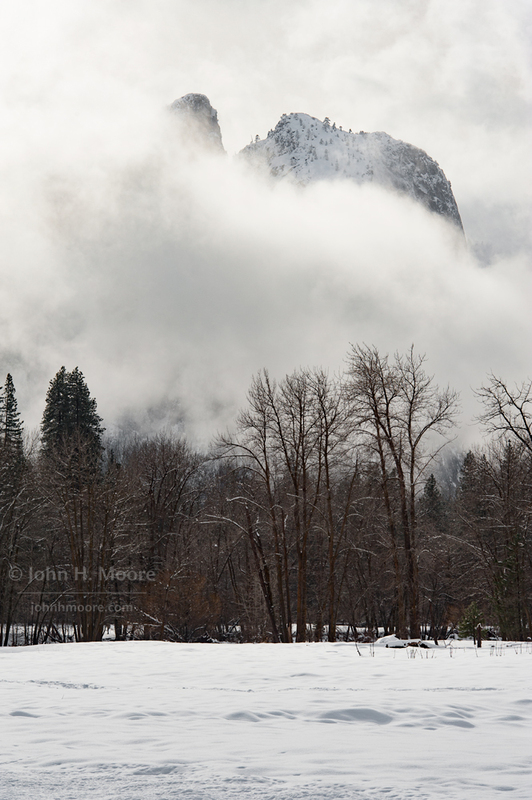 Sentinel Rock overlooks icy flooded wetlands in Cook’s Meadow, Yosemite National Park. El Capitan looms through the falling snow over the Merced River in Yosemite National Park. 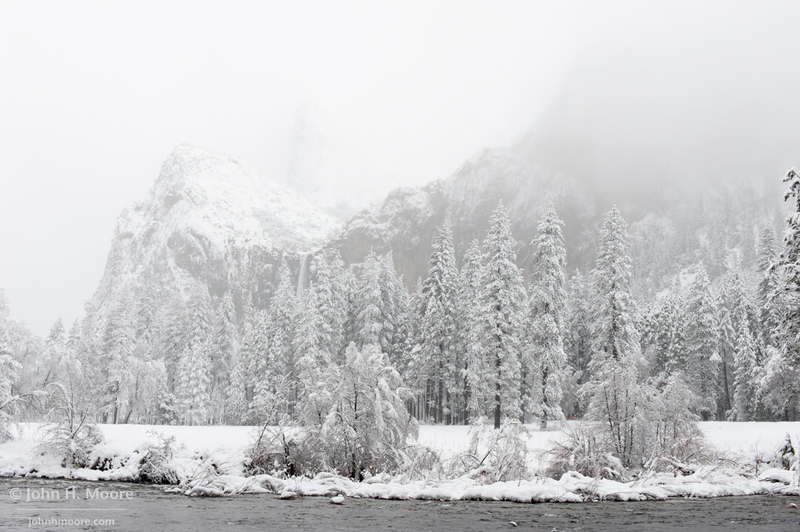 Bridalveil Falls during a snowstorm. Yosemite National Park. 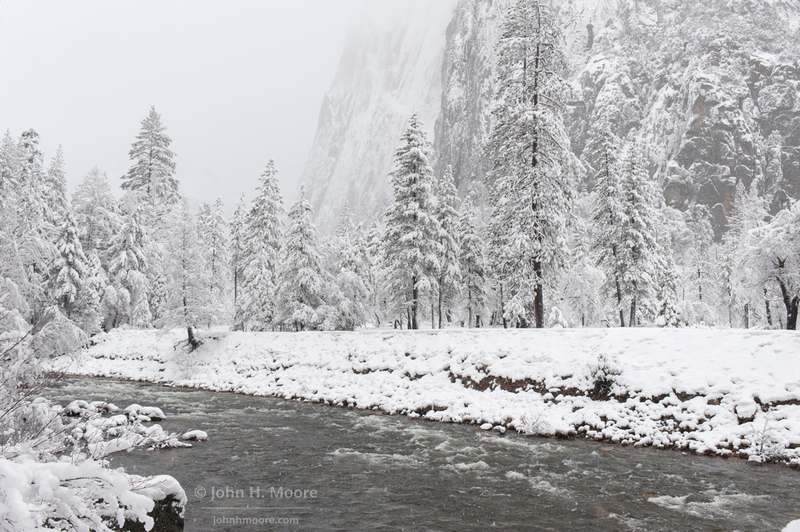 Footbridge over the Merced River in Yosemite National Park during a winter snowstorm. This entry was posted on February 12, 2017. It was filed under Uncategorized.